If you watched my haul video, you heard about this statement sweatshirt I found in Hong Kong. I know, it’s a little out there, but I LOVE it! 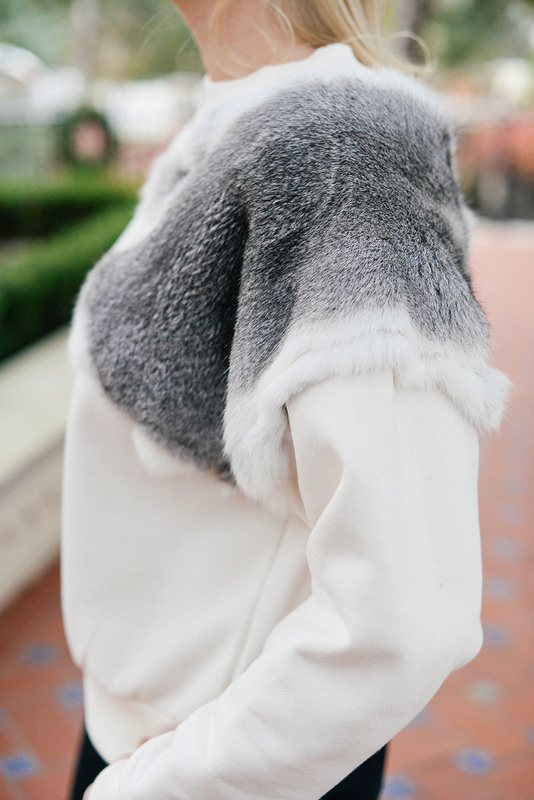 I adore how the luxe fur detail dresses up such a comfy, cozy, everyday piece. It’s a fun top to throw on with jeans and leggings when I want to be comfortable, but look cute, just in case I run into anyone I know. I always bump into people more around town when running holiday errands than any other time of year… anyone else? Variations of this outfit have been on repeat so I don’t get caught looking like a slob on my busiest days! If you’re looking for a cozy sweatshirt with an elegant twist, try this bell-sleeve Burberry popover, this lace appliqué style by Carven, or this deconstructed DKNY sweatshirt. These sparkly loafers would be an adorable way to put a pep in your step this holiday season! Wear with jeans and sweaters during the day, but could also be a cocktail shoe at night! PS – they’re under $70. Also loving these streamlined (but sparkly) Joie slides! Sort of in line with my crazy sweatshirt, the statement shoe of the winter season is Gucci’s fur-lined loafer. My sister has a pair and LOVES them! So comfy and they add some texture to your go-to casual weekend ensembles. I surprisingly really like this pink pair too… Totally not what I’d normally want! These metallic Nike sneakers are sooooo cute! I feel like the silver color would go with everything, don’t you? If it’s super cold where you live, you’ve gotta invest in some UGG boots. I talked a little about two of my pairs here! 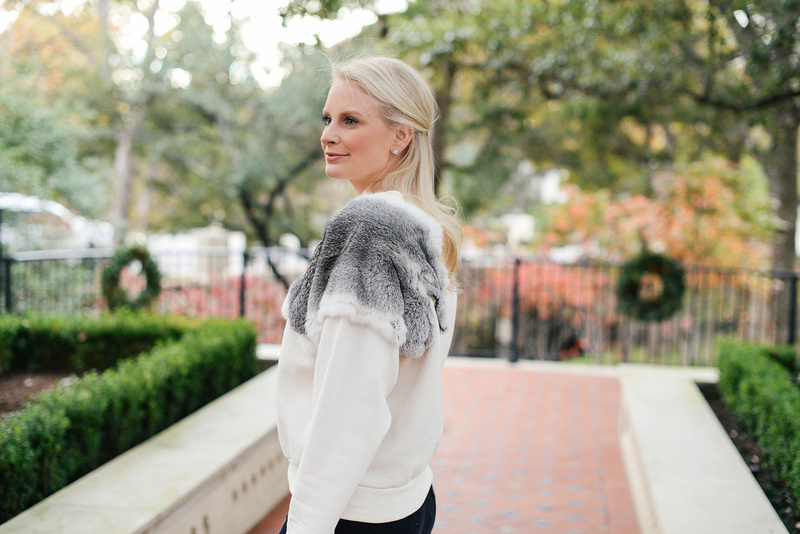 It usually doesn’t get super chilly until January/February in Dallas, but last week we got a taste of the 30’s and I whipped my favorite pair out in a flash! My sneakers have been on repeat as well, so easy to just put them on and go. This sweater is fabulous. this sweatshirt looks AWESOME! So cozy!! How cool is your sweatshirt!! Love that little bit of fur detail, so unique! That sweater is such a fun statement piece! I’m so in love with the detail on the shoulders! I wouldn’t say that it’s out there at all, especially since you kept the rest of your outfit pretty simple. Wow such a beautiful jumper! This sweater is too fun and special since it will always remind you of your amazing trip to Japan/Hong Kong! Your blog is amazing and you have an amazing style!